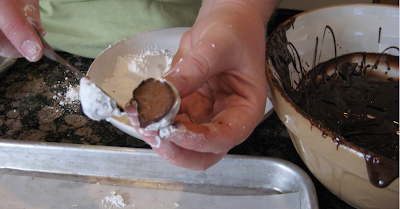 The Great Cooking Spirit: Chocolate dipping fools! 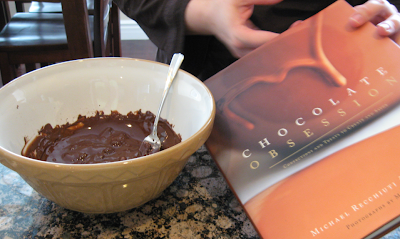 Yesterday I got together with my friend Chef Tess for a total chocolate fest! Stephanie and I were fast friends in culinary school, had lost touch and were recently reunited. It's been so fun catching up and sharing in our mutal obsession with all things culinary - especially all things chocolate! 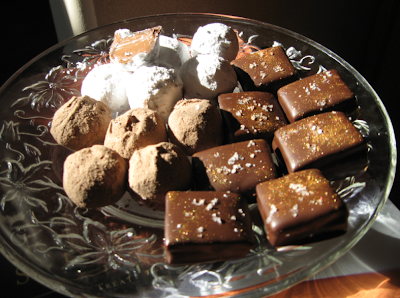 If I'm a sucker for all things chocolate, truffles have to be at the top of the list of what I like. The smooth, silky, creamy centers that melt in your mouth after you break open the thin chocolate shell... Keeping with the caramel theme, these were milk chocolate caramel truffles. 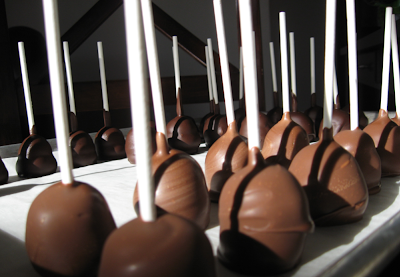 What's a chocolate dipping day without cheesecake lollipops - one of my all time favorites? I'd share more of what we did, but I'm feeling a bit snackely and might need to do a bit more product sampling. Can you blame me? In the meantime, you can see more pictures here or on Chef Tess's Blog. 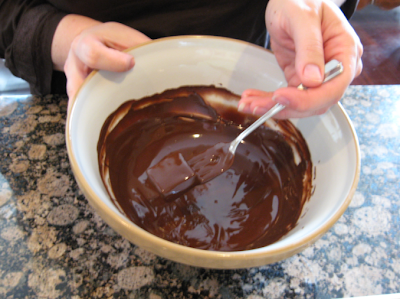 I am the village idiot of chocolate dipping! Thanks. I love being a fool!! It keeps me young!...at heart anyway!